But we all know what is said about the road to hell. 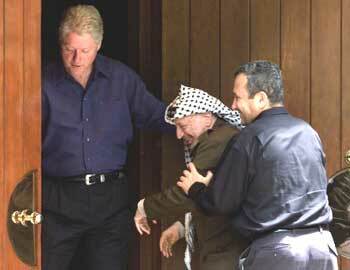 Ten years ago, Bill Clinton pushed Israelis and Palestinians to a summit when neither side was ready for an agreement. It seems Obama has not learned this lesson from history. current Israeli government might, given the right circumstances, agree to remove some settlements, but it is inconceivable that this government would agree to remove enough settlements to allow for a viable Palestinian state. And the notion of them compromising on Jerusalem is simply absurd. Even if it were possible that Netanyahu would agree to such things, the current composition of the government makes it impossible, and there is insufficient political will in Israel right now to make the changes that would be required. It’s not inconceivable that even a Bibi-led government could make the compromises necessary, but that government won’t be this one, and changing the political winds in Israel will take some time. And on the Palestinian side, the PA-Hamas split is showing no signs of healing, making it impossible for a true end of conflict agreement. There are political reasons why it makes sense for Obama to be pushing direct talks right now, but they’re not very impressive ones. They’re domestic concerns, supporting Israel’s position, and part of his election year outreach to the Jewish and Christian groups that are seeking to attack Democrats based on Obama’s Mideast record. We’ll leave aside for now the point that Obama has done much more than his predecessor to increase Israel’s military supremacy in the region. But in terms of promoting Middle East peace, this is a dumb move unless Obama is willing to back it up. Direct talks are necessary if the US is to really influence an outcome agreement. But if Obama is not willing to pressure both sides, not only the Palestinians, talks will end in disaster and Obama will not only find himself in a new Mideast quagmire, but the failure will give his political opponents fresh ammunition and lots of it. But there is a real limit to how much Abbas can do to ensure that Obama holds up his end. And, indeed, even more is needed—if talks are to be productive, let alone ultimately successful, Obama will have to be willing to push an American vision of two states that includes contiguous Palestinian territory at least roughly equivalent to the whole of the West Bank and a truly shared Jerusalem. Abbas can go some distance toward creating political pressure for Obama to do that, but a lot of the responsibility will be on American activists to create the bulk of it. And there’s way to do it in November. The radical right wing “Emergency Committee for Israel” (ECI) is dedicating all its resources to defeating Democrat Joe Sestak in Pennsylvania’s election for Arlen Specter’s Senate seat. Those who want to see peace in the Middle East would do well to rally around Sestak. If he wins the race, and if exit polls show that he kept the Jewish and pro-Israel votes, this will send a powerful message in Washington, probably a lot more powerful than it might seem at first blush. There’s probably no more powerful way to create the political atmosphere for Obama to act than for Sestak to win the pro-Israel vote in that race, even if he loses overall. In any case, if Obama is going to act boldly, the pro-peace gloves have to come off. It’s another opportunity to bemoan the inability of the left and center-left to work together. J Street needs to adopt some of the more uncompromising criticism that groups like Jewish Voice for Peace (JVP) are leveling against the radical right-wing tilt Israel has taken, while JVP and like-minded groups need to be able to channel that clarity through groups like J Street into more direct political effect. That these groups cannot find a way to do that continues to limit their effectiveness, especially as compared to their pro-status quo or radical right counterparts. Still, this is where the hope lies. The domestic political winds have already shifted a bit, and ECI’s very formation is a reaction to that fact. But more is needed, and soon, because it doesn’t seem as if Obama has a plan. Lacking that, the political winds will have to blow harder, or the push for direct talks will end in just as disastrous a way as Camp David II did. This entry was posted on July 30, 2010 at 5:08 pm and is filed under Uncategorized. You can follow any responses to this entry through the RSS 2.0 feed. You can leave a response, or trackback from your own site.